Advanced 3D Laser Solutions have reached our fifth year of trading offering services across process industries including our new Laser Surveying Software Solutions. Many friends have been made along the way as we build an excellent client base. By carefully planned marketing strategy, we are not only building a business but developing a brand recognised around the world for it’s quality, values and integrity. We have had the pleasure and privilege of working for some of the biggest brands in the industry, collaboration with other companies has played an important part of our growth. WHAT HAPPENED BETWEEN 2016 AND 2017? At Advanced 3D Laser Solutions, we have 40 years of engineering experience on side. Compared to other surveying companies we understand the way this industry works which allows clients to feel at ease due to the hazards which occur on site. This has allowed for ALS to increase in size fairly quickly due to the demand of our services. Below is a photograph of the current ALS team. An example of this occurred when we exhibited at StocExpo (Rotterdam) with CEA Systems http://www.ceasystems.com/ and their laser surveying software solutions. 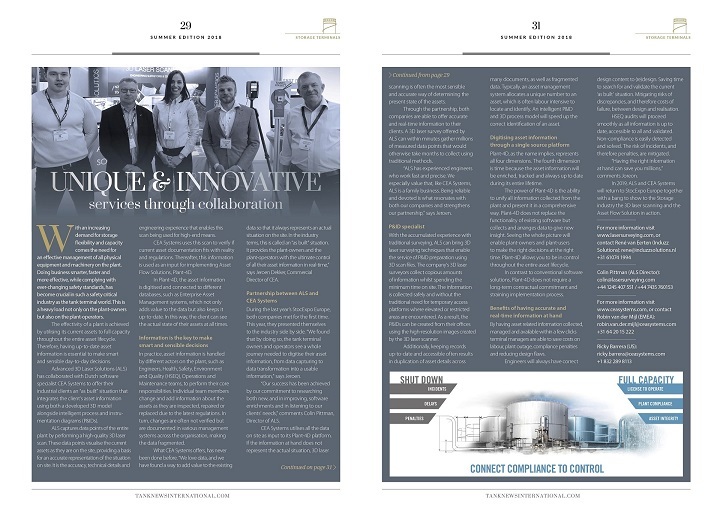 Both companies had an excellent opportunity to showcase our services to the Tank Storage community, the result of which led to an article in Tank News International called ‘UNIQUE & INNOVATIVE’ services through collaboration, please see attached.